Everyone has lots of passwords related to their personal & professional stuff. We can’t imagine our life without any password in today’s technology world. Managing the password is not so easy and for me also it’s a tough job so I was in search of one platform which can act like password manager and fortunately I got it named as PassVult. This app is really helpful for storing and managing the data. I store all my data on this platform and believe me it’s very easy. 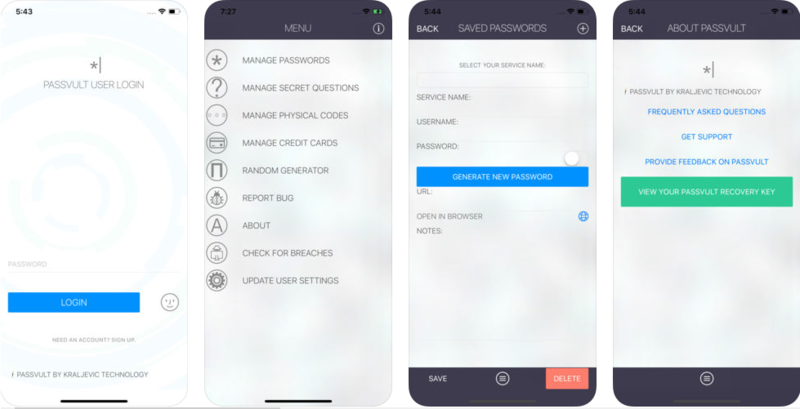 It’s because it is a password manager where the user can get ownership of their password as there is localizing the data on an individual iDevice. Coming on the features, I introduce you to some interesting facts regarding this app. Storing of password: You can store and manage the entire password. This means all your passwords will be safe in one place. Secret questions and answer: You can have secret questions and their answer. Physical code storage: This feature enables you to store the physical codes related to your service. Generating password: You can generate the strong and secured password with in this app. You can also choose the length of the password as 8, 12, 14, 16, 20, 24, 28, 30 & 32.
AES encryption: The entire data store in this platform is encrypted with Advance Encryption System. Use of master key: You can have master key from which you can access all your passwords. Accessing the PassVult is really an easy process. Only you need to download and install the app. Then you need to log in with the password or fingerprint access. You will get a menu where there will be different options like manage passwords, manage secret questions, manage physical codes, and manage credit cards. Choose your option and access the app as per your choice. Moreover, kindly don’t forget your PassVult password as it will not allow you to reset the password. Price of the app: The price of the app is $2.99 which is available at Apple Store. There is also free version named as PassVult lite with the functionality of storing password only. The app is fully useful and from my side, there are no complaints. If you want to protect all entire passwords at one place then try this app. It’s a wonderful app with all the interesting features.